This card set provides a wide range of key considerations for mentoring. Collected over a number of years, the 50 Tips encourage people to think about their own mentoring experiences and make decisions about the effectiveness of their current mentoring programme and engagement in this. 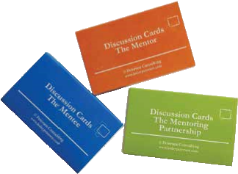 Use this card set in mentoring training workshops or community of practice meetings where mentors and mentees have the opportunity to discuss the key statements in relation to their own mentoring activities. The 50 Tips may prompt people to review their mentoring practice, make changes in their mentoring practices, review their current programme, or simply offer a general discussion point.